Advanced amino acid supplement that contains the highest quality BCAA, which have been enriched with glutamine, taurine, citrulline and vitamin B6. Such a combination is not only a guarantee of protection against catabolism of the body but also the support of his endurance training! Searching for the perfect product for you certainly browsed many warehouses and descriptions - but if you actually care about BCAA branched amino acids of the highest quality is what they found! Excellent additives in the form of glutamine and citrulline malate make using this formulation not only secured the their muscles against catabolism but also be supporting exercise capacity and health of your body! HIGH QUALITY branched chain amino acids BCAA - HIGH DOSE OF EACH SERVING! 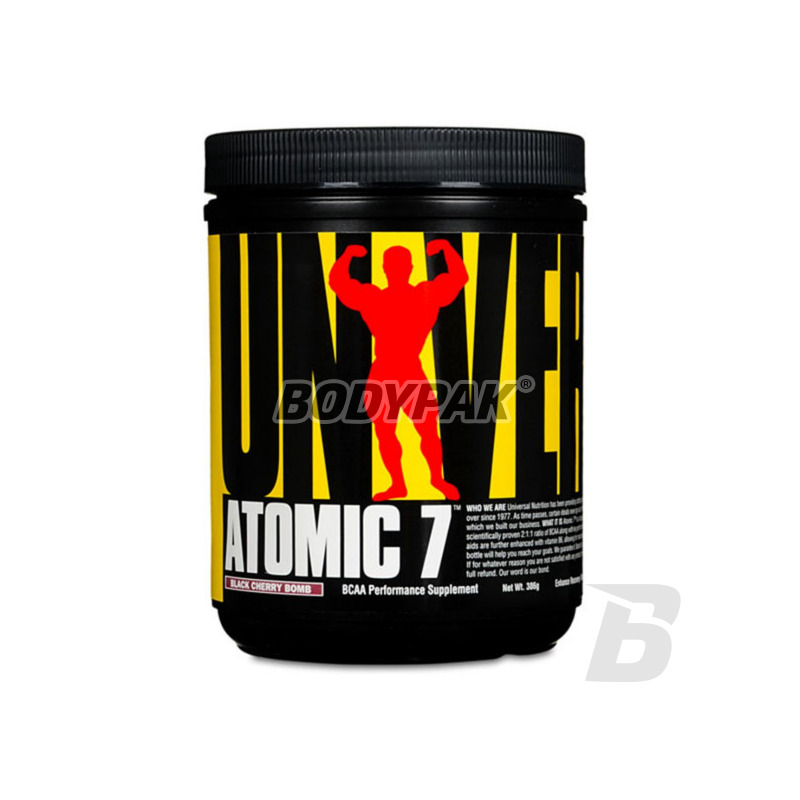 Universal Atomic 7 is a supplement aimed at maximum utilization of BCAA action. The product combines scientifically proven to BCAA ratio of 2: 1: 1, and necessary to increase the efficiency of materials such as malate, citrulline, glutamine and taurine, vitamin B6. Strong ergogenic supplement not only increases the efficiency of training, but also accelerates regeneration and improves durability. EFFECTIVE EXTRAS: citrulline malate, L-GLUTAMINE AND TAURINE. Universal Atomic 7 is the most advanced mix of L-Leucine, L-Valiny and L-isoleucyny, each containing up to 8g of these key amino acids for regeneration, thus allowing the body to achieve an unprecedented recovery. Included in the seven Atomic constituents, such as malate, citrulline, glutamine, taurine, vitamin B6 and create an ideal environment for absorption of branched chain amino acids. Vitamin B6 increases the effectiveness of BCAA, taurine and citrulline malate facilitate their assimilation and accelerate the rate of absorption. The combination of these substances in one product ensures maximum absorption and effect of BCAA. 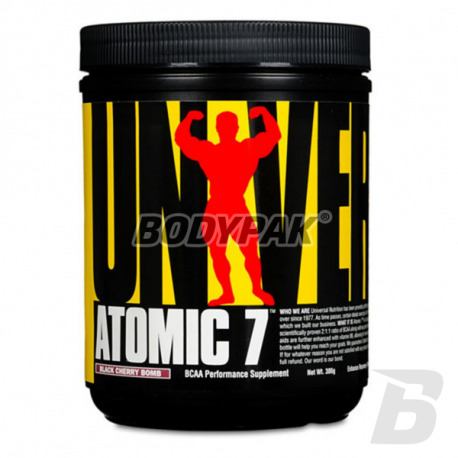 UNIVERSAL ATOMIC 7 - INVEST IN YOURSELF AND ENJOY THE EFFECTS! 1 portion once a day. Other ingredients: citric acid, natural flavor, acesulfame K, sucralose, red # 40 lake, FD & C Blue # 1, pyridoxine HCl.